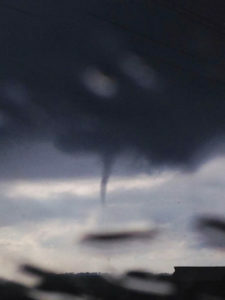 NWS photo of a funnel cloud near Radcliffe. Strong thunderstorms produced hail, funnel clouds and a few tornadoes as they moved across Iowa on Monday afternoon. The National Weather Service received reports of at least six tornadoes touching down across the state. While there were no reported injuries, two caused some minor damage. In Hardin County, local law enforcement officials reported that tornado damaged some roofs, knocked down trees and power lines, and overturned a vehicle in the town of Radcliffe. Further east, in Butler County, a twister took a few buildings off their foundation near Parkersburg. Tornadoes also reportedly touched down in rural areas of Grundy, Monroe and Poweshiek counties. Survey teams from the National Weather Service are expected to assess storm damage in the affected areas today.